November 25, 1996: A midlevel manager at NeXT contacts Apple about the possibility of Cupertino licensing NeXT’s OpenStep operating system. Garrett L. Rice’s communication with Ellen Hancock, Apple’s chief technology officer, is the first formal step in a long process. It ultimately leads to Apple buying NeXT, the creation of OS X, and Steve Jobs returning home to the company he co-founded. Apple’s decision to consider licensing NeXT started with the failure of Apple’s Copland project. That next-gen operating system never got any further than a beta version released to around 50 Mac developers. By 1996, Apple was losing money hand over fist. The company desperately needed something that would let it compete with Microsoft’s dominant Windows 95 operating system. It was apparent that licensing Mac OS to third-party manufacturers wasn’t going to be the magic elixir Apple had hoped for. Apple CEO Gil Amelio told Mac followers the company would unveil its new operating system strategy at MacWorld Expo in January 1997. However, inside Apple it was apparent that this was more a matter of buying time than finishing off the finer points of an existing strategy for showing off to the public. BeOS debuted in October 1995 on the zippy (and now highly sought-after) BeBox computer. The first modern computer operating system written in C++, it boasted impressive multimedia capabilities. Features included symmetric multiprocessing, pre-emptive multitasking, pervasive multithreading, and a custom 64-bit journaling file system known as BFS. Gassée has since said, “Thank god [Apple didn’t buy BeOS] because I hated Apple’s management.” However, at the time, many people thought it would make a good fit for Apple. If nothing else, BeOS shared the philosophy of clear and uncluttered design that characterized Mac OS. At the time, Gassée reportedly tried to strike quite the hard bargain with Apple, with Be’s investors holding out for $200 million. Apple drew the line at paying more than $125 million. The other realistic option Apple had was NeXT. The company had been Jobs’ main focus in his time outside Apple (although his other company, Pixar, made him a billionaire). NeXT was ahead of its time in both software and hardware. But the company never quite lived up to its potential. After abandoning its hardware business, NeXT focused entirely on software by 1996. 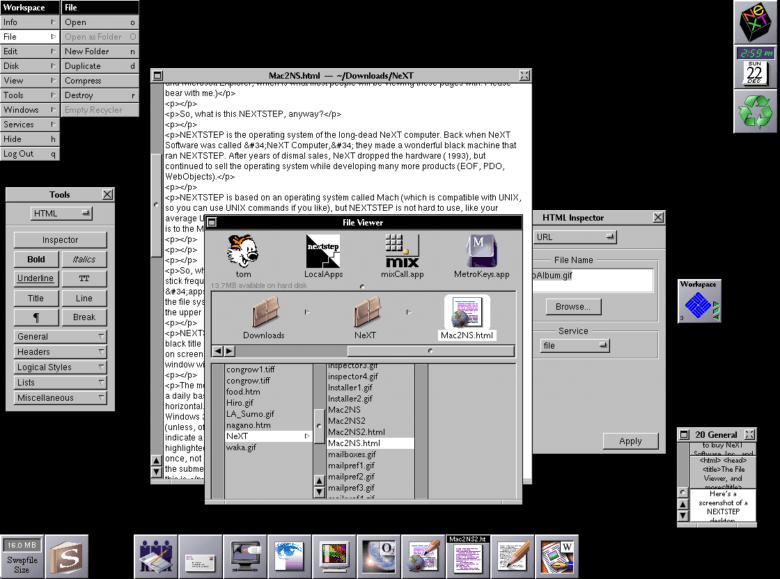 OpenStep was an open version of NeXT’s NeXTSTEP operating system. The object-oriented, multitasking operating system was based on UNIX, which later became the basis for OS X and, subsequently, macOS. By November 1996, Jobs was speaking with Amelio again (albeit only very recently). Jobs advised that Be was not the right choice for Apple. The November 25 phone call from NeXT’s Rice presented the option Jobs surely wanted all along: that Apple acquire the rights to put a version of OpenStep on Macs. By early December, Jobs visited Apple HQ for the first time since his ouster. A deal would bring both NeXT and Jobs aboard — the best decision Apple made in years.